Loki has a home! 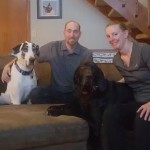 - Rocky Mountain Great Dane Rescue, Inc.
Loki has a home with his foster family in Littleton, CO. Jamie currently has a female Dane named Ava along with a cat named Kona. The family has always loved the personality, intelligence and emotional attributes of Great Danes. The time came where they wanted to bring another Dane into their home for themselves and Ava. When Loki came into their home as a foster they soon realized he wasn’t going anywhere else. This sweet boy stole everyone’s hearts and fit in perfectly. Way to go sweet boy!